Aaron Heading, who won gold in the men's trap singles at the 2010 Commonwealth Games, believes he can set a new world record at London 2012. 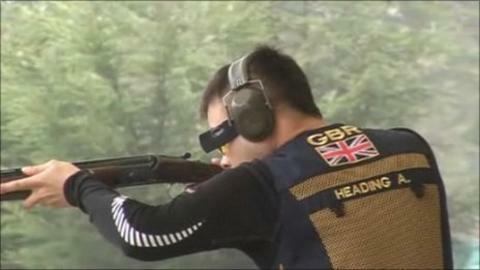 The 24-year-old Lincolnshire shooter says winning Olympic gold has been a long-term ambition. "My aim is not just to win gold, but to set a new world record," he said. "The day I realised it was an Olympic event it became the target, and when London won the bid the Olympics it became the thing I wanted the most." Heading held his first shotgun certificate at the age of nine. His mum, Lyn, who has travelled the world following her son, admits that to watch him competing at the Olympics would be an emotional experience. "At the moment we have no tickets, but we'll pitch up and watch him on the big screen," she said. "It's something he enjoys doing, so we are with him all the way." Aaron's dad John believes that his son has time on his side and will go on to represent his country in future Olympics. "At the moment he is number one in Great Britain and if he gets the chance to go to the Olympics that is the goal," he said. "I can see him going on to compete in the next three or four - this is just a step in the right direction, if he goes." Aaron Heading is one of BBC Lincolnshire's featured athletes as part of 'Olympic Dreams' in the build-up to London 2012.